The Giant Room is located +/- 6 km from Theux and +/- 8 km from Spa and Remouchamps. Works in progress in Theux area! when possible, the E40 (Verviers > Germany)! More information on Theux website. On the national route #62 from Theux to Spa, drive 2 km from the centre of Theux; then take right following the direction of La Reid. Drive on this route for +/- 1,8 km, pass the village of Hestroumont. 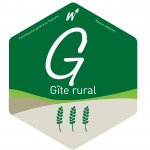 900 m after the village, you will see a big farm on your right, with indications “Ferme de la Carrière – Salle du Géant – Gîte rural”: go down the way in the direction of the farm. At the “Y”, take left and go to the parking place. The owners, Chantal and Vincent, are living in the main house: please go to their house and ask them the key! On the national route #62 from Spa to Theux, drive 5 km from the centre of Spa; then take left, following the direction of La Reid. Drive on this route for +/- 1,8 km, pass the village of Hestroumont. 900 m after the village, you will see a big farm on your right, with indications “Ferme de la Carrière – Salle du Géant – Gîte rural”: go down the way in the direction of the farm. At the “Y”, take left and go to the parking place. You’re about 8 km from us. Take the national route #697 in the direction of Spa; on this route, drive 6 km till the centre of the village of La Reid. In the village, on the Place du Marais, turn leftin the direction of Theux. On this route, drive 1 km. You’ll see, on your left, a big farm and indications “Ferme de la Carrière – Salle du Géant – Gîte rural”: go down the way in the direction of the farm. At the “Y”, take left and go to the parking place.